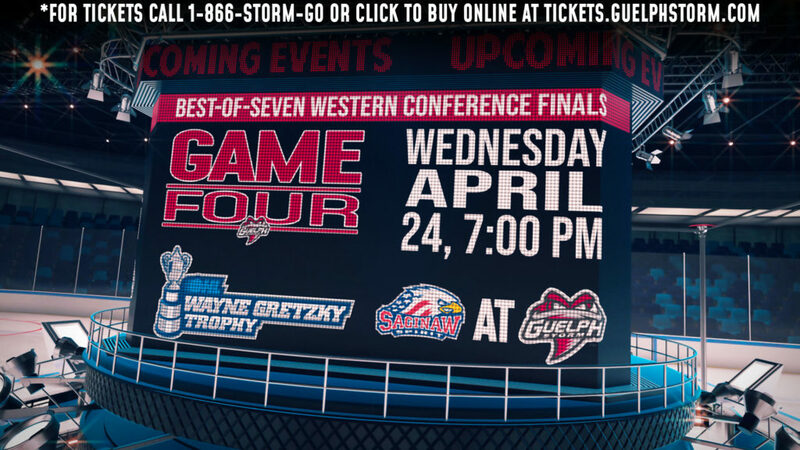 The Guelph Storm wrapped up the home side of the 2017-18 regular season schedule with quite the finish on Tuesday night at the Sleeman Centre. 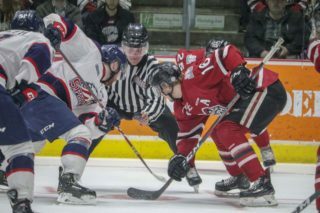 Down 3-0 to the visiting Kitchener Rangers minutes into the second period, the Storm went on to score four unanswered goals en route to an exciting 4-3 win. 56 seconds into the overtime frame, Isaac Ratcliffe netted his 39th goal of the season. Assisting on the goal was defenceman Ryan Merkley, who paired the helper with a goal earlier in the contest. 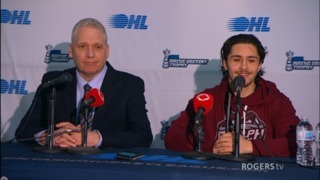 Overager James McEwan also posted two assists, who, along with captain Garrett McFadden and defenceman Mark Shoemaker, were honoured prior to the game in the organization’s annual OA presentations, recognizing the three players for their commitment to the Storm, and the Ontario Hockey League. Between the pipes, Anthony Popovich put together a solid performance, turning aside 37 of 40 attempts on the night. For the Rangers, goaltender Luke Richardson turned away 22 of 26 shots. Offensively, Riley Damiani did most of the damage, registering two goals, starting with his first of the contest with 59 seconds remaining in the first period. Building on the 1-0 lead early in the second, Logan Brown made it a 2-0 game 2:41 into the period, while just over a minute later, Damiani struck again, putting the Storm down by three before the five-minute mark of the middle frame. Looking to the latter half of the second though, the Storm jumped on the board as Zach Poirier put in some work to grab an assist on a nice finish from Merkley. Down 3-1 to begin the third, rookie Mason Primeau was next on the comeback path, registering his sixth of the season on the rebound to pull the Storm to within one at the 11:18 point of the frame. With under two minutes remaining in regulation, Alexey Toropchenko found the back of the net with a quick wrist shot to send the game to extra time. 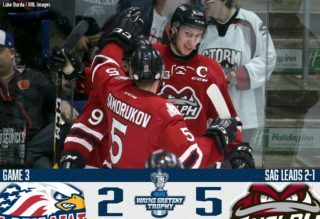 56 seconds into overtime, it was Ratcliffe finishing off a three-on-two rush, making it four unanswered goals from the Storm in the 4-3 win. The Storm now look ahead to visiting Kitchener on Friday, and finishing out the 2017-18 regular season schedule on Saturday in Erie. 2nd Period-2, Kitchener, Logan Brown 21 (Sherwood, York), 2:41. 3, Kitchener, Damiani 19 (Meireles, McHugh), 3:59. 4, Guelph, Merkley 13 (Poirier), 13:54. Penalties-Gentles Kit (hooking), 6:23; served by Garreffa Kit (too many men), 8:48; Hawel Gue (inter. on goaltender), 19:32; Austin McEneny Kit (hooking), 19:49. 3rd Period–5, Guelph, Primeau 6 (McEwan, Samorukov), 11:18. 6, Guelph, Toropchenko 16 (McEwan), 18:11. Penalties-Meireles Kit (interference), 1:10; Toropchenko Gue (tripping), 11:57. Shots on Goal-Kitchener 18-9-12-1-40. Guelph 10-6-9-1-26. Power Play Opportunities-Kitchener 0 / 2; Guelph 0 / 4. Goalies-Kitchener, Richardson 23-11-2-0 (26 shots-22 saves). 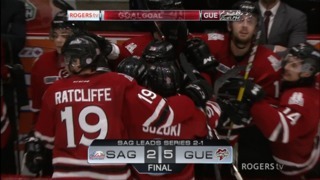 Guelph, Popovich 28-21-4-3 (40 shots-37 saves). Referees-Mike Cairns (34), Michael Markovic (37). Linesmen-Kevin Hastings (61), Jean-Francois Menard (52).